It was 1967 when Pete Seeger wrote the song, ‘Waist Deep in the Big Muddy’, but he couldn’t get it on the air due to censorship because of the Vietnam war. It took a year for the song to go public. Funny sometimes how things don’t change. The Big Fool still wants us to push on. On August 23, we headed out with a collaborative team headed up by Dr. Chris Pincetich of the Sea Turtle Restoration Project, Captain Al Walker & Marine Biologist & Captain Scott Porter of Ecorigs. Our merry band included folks from Oceanic Defense, Sea Shepherd, Mission Blue, The National Wildlife Federation and All Eyes on the Gulf. What a mob! Our mission was to head offshore to find bluewater, where we hoped to locate turtles and also to take samples of sargassum to see if there were any signs of hydrocarbons. But we found no bluewater and no sargassum. Our divers did spot one Kemps Ridley Turtle on the rig. We saw few bait balls, a few seabirds, and our guides, longtime fisherman Captain Al, and local marine biologist Scott Porter agreed that life out there was scarce. 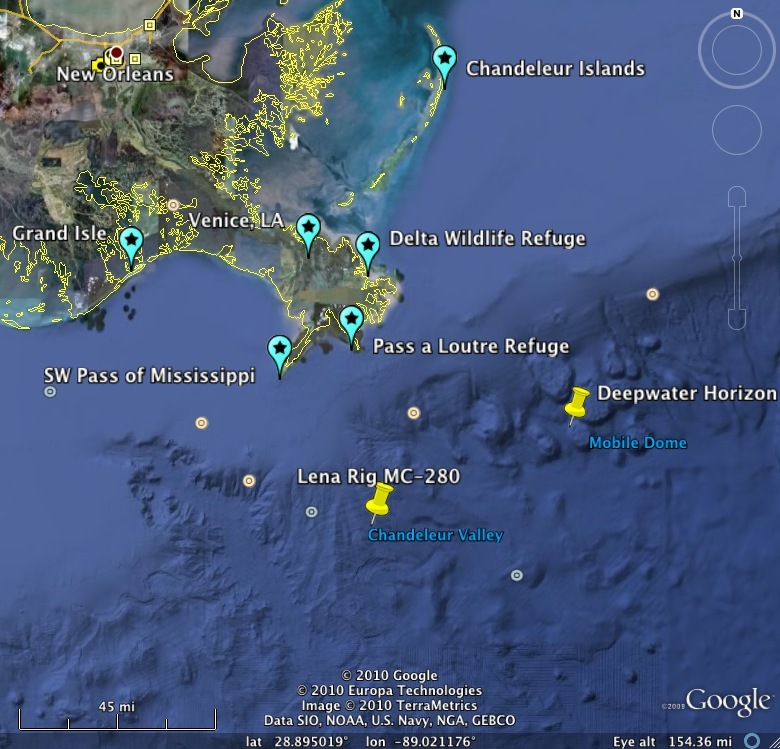 Ten miles outside of the Southwest Pass of the Mississippi, we approached Exxon Mobil’s Lena Oil rig. It has been producing since 1984 and sits in 1000 feet of water on the edge of the Mississippi Canyon. It’s no wonder that there is so much life growing on the rig. Notorious for ripping currents & big sharks, the Lena Rig promised to be an exciting dive. almost deafening. It was an ominous, reverberating sound that felt like it vibrated every cell of my body. As a diver, I immediately thought of the poor fish gathered below, living with all of that amplified sound. 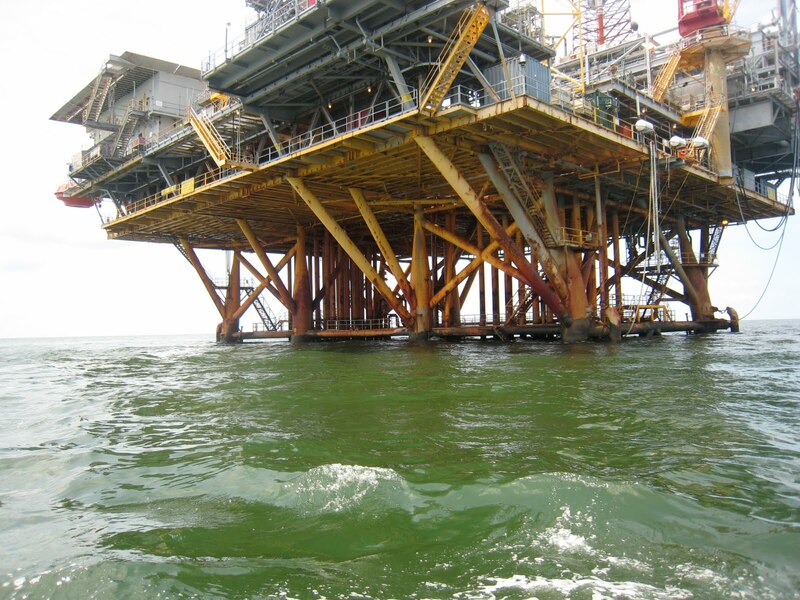 But the rigs do offer a safety of sorts – their latticework of metal below the water acts as an artificial reef where the fish can find shelter and food. Our two captains and dive leaders Al Walker and Scott Porter checked out the conditions. Visibility was low and the currents were moderate. Hoping for better visibility beneath the surface layer, they decided it was a go. Fox News 8 from New Orleans was onboard, and they did a great piece the next night highlighting underwater footage shot by Al and Scott. OK, so for all of you who know me, you’re thinking, “Why didn’t she dive?” Well, my hat is off to the guys who did, but I’m just not sure about this toxic soup. I hope to return to dive out in the blue water on some of the rigs farther offshore, but as you’ll see from the map image, this rig is right in the thick of it, and so I decided to observe from the surface. 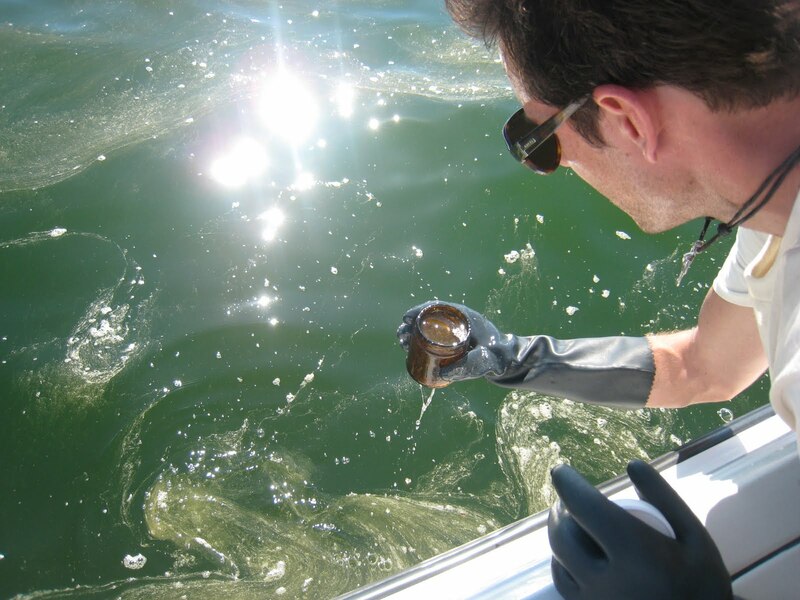 On the way back to shore, we took water samples to be sent off for independent testing. As you can see, we encountered some very nasty stuff. In the video, the material on the surface that looks like mucous is, we think dispersed oil, and was actually taken the day before. On August 23, we found only foamy bubbles with brown oil on the surface. Conditions change from day to day a great deal. Our day ended with a beautiful ray of hope, as we came through the marshes on the way back to Cypress Cove Marina in Venice. We saw egrets, herons, and roseatte spoonbills in greater and greater numbers as we came inland. They seemed to be healthy, and we saw adults and juveniles. It was breathtaking, and actually healing after what we had seen offshore. So yes, all this, and The Big Fool Says to Push On. What do you say? Shall we push back? >Great reporting and observation, Deb.